Like the name suggests Geranium maderense (picture right) are originally from ‘Madeira’ and although a spectacular plant when in flower this large growing geranium has its idiosyncrasies. Sometimes called the ‘Giant Cranesbill’ this is a biennial rather than a perennial plant, however it tends to behave like a perennial in good conditions. It is a species that grows well in a frost free environment. It is in summer when the plant is covered with masses of bright pink flowers that it is most admired. However its palmate foliage is also attractive, a good mid to pale green and the large leaves add texture to the garden. The largest of all of the geraniums this one is from the canary islands. Flowering form spring to mid simmer this one may take a year or two to flower, but is well worth the wait. For its spectacular large head of flowers. Large green fern like foliage, flowers are usually pink although a white form Geranium maderense ‘White Guernsey’ is available, but rare. Both forms will reach about 1m. 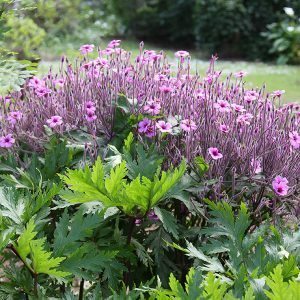 In its natural environment Geranium maderense is an understory plant and it will grow well beneath both evergreen and deciduous trees. Try growing these is part shade in a humus rich moist soil but well drained. Little extra care is needed, they do not seem to require much fertilizer. Over time the older foliage tends to droop towards the ground. Gardeners do like to prune plants, however these leaf stalks (petioles) should be left as its part of the plants survival mechanism, they support they plant. From seed or seedling it will take around three years to flower, and then it will die, well worth the wait as it is spectacular, however you really need to have a few of these in the garden to ensure an ongoing display from year to year. As they self seed, if you take care of the seedlings you will have not problems.